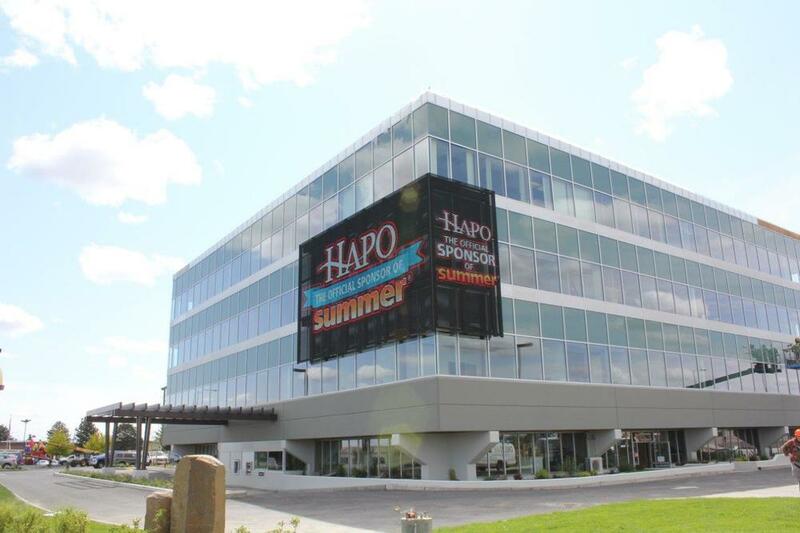 The LED transparent video display at HAPO Community Credit Union is yet another example of how building architecture can be used to get a message across creatively, all the while saving cost and energy. This S|ThruMedia™ LED installation, manufactured and supplied by S|N|A, at HAPO's Kennewick, WA branch is built with horizontal LED strips. Each strip consists of one row of pixels, spaced 16 mm apart. Vertically, the strips are placed 48 mm apart, creating approximately 48% transparency. This spacing also allows tenants to see out of their windows with minimal obstruction. Measuring approximately 20'0" high by 45'4" wide, the display's resolution is processed as 379 x 888 pixels. To create a seamless wrap around the office building, S|N|A designed and manufactured a custom corner for the project. The project also includes a three-sided full color monument sign on the same property. This message center utilizes a 10 mm pixel pitch, packaged with surface-mount device (SMD) technology for an enhanced look and wide viewing experience. The display’s two main faces are approximately 4’0” high by 5’7” wide. The third face, which gives the display a cubed or three-dimensional look, is approximately 4’0” high by 19” wide. The total resolution of the display is 108 x 384 pixels. The perfect addition to a modern, predominantly glass building facade, the S|ThruMedia™ product has a very thin profile, about 1/4 the depth of a typical LED display. Additionally, compared to a standard screen of the same size and pitch, HAPO's S|ThruMedia™ display system uses a third of the energy and is less than half the weight.